Did you know? Honey never spoils. Bee-lieve it or not it's true! Here at GOLDEN BLOSSOM HONEY we've been collecting amazing facts about honey and honeybees for over 80 years. The following is a collection of our favorite honey facts that is sure to fascinate and amaze you. Honey never spoils. No need to refrigerate it. It can be stored unopened, indefinitely, at room temperature in a dry cupboard. 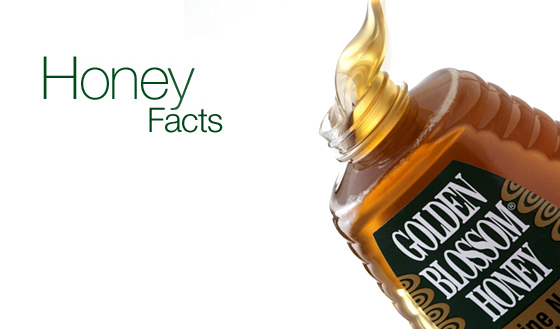 Honey is one of the oldest foods in existence. It was found in the tomb of King Tut and was still edible since honey never spoils. To make honey, bees drop the collected nectar into the honeycomb and then evaporate it by fanning their wings. Honey has different flavors and colors, depending on the location and kinds of flowers the bees visit. Climatic conditions of the area also influence its flavor and color. To keep their hives strong, beekeepers must place them in locations that will provide abundant nectar sources as well as water. In the days before biology and botany were understood, people thought it was a special kind of magic that turned flower nectar into honey.